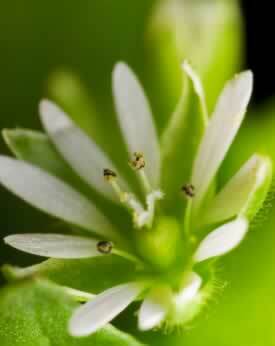 Chickweed is best known for it's ability to cool inflammation and speed healing for internal or external flare-ups. Chickweed tea is an old remedy for obesity, according to Culpepper, and wise women and herbalists still drink teas of fresh chickweed as one of the classic spring tonics to cleanse the blood. 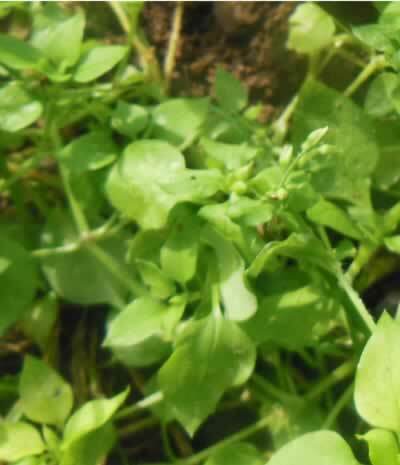 Chickweed poultices are useful for cooling and soothing minor burns, skin irritations, and rashes particularly when associated with dryness and itching. Learn to identify and make use of this common "weed" that is probably growing in your back yard to ensure a free lifetime supply of salves, spring salads and teas. Fresh chickweed can be eaten in summer salads and can be fed to companion animals to assist in the expulsion of hair balls, and sooth the digestive tract. Chickweed is an effective and gentle laxative. The seeds are food for finches and many other seed-eating birds. They say the best things in life are free, and chickweed is a great example. Preparation Methods & Dosage :Fresh herb teas, salad greens, poultice, ointments and salves. Chickweed Side Effects: Generally considered a safe medicinal food plant- large amounts of chickweed can have a laxative effect. When wildcrafting be careful of herbicide contamination, as chickweed is often found living among hated weeds. Flowers: Small, white, on slender pedicels from leaf axils, also in terminal dusters. Calyx (usually) of 5 sepals, much longer than the 5 (usually) 2-parted petals; 2-10 stamens; 3 or 4 styles. Stem: Weak, branched, tufted, leafy, 4 to 6 in. long, a hairy fringe on one side. Leaves: Opposite, actually oval, lower ones petioled, upper ones seated on stem. Preferred Habitat: Moist, shady soil; woods; meadows. Flowering Season:Throughout the year. Chickweed water is an old wives remedy for obesity. It is a fine soft pleasing herb under the dominion of the Moon. The herb bruised or the juice applied with cloths or sponges dipped therin to the region of the liver, and as they dry to have it fresh applied, doth wonderfully temperate the heat of the liver.